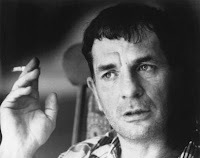 I have continued to read On the Road by Jack Kerouac, and I am fascinated by the character of Dean Moriarty. He is Sal's primary traveling companion across the highways. Dean is perennially self-destructive, irresponsible, and even criminal. Yet he expresses one truly laudable trait: at every moment of his life, he is trying to squeeze out every last drop of joy. He is a truly happy person who takes delight in everything he sees. Dean spends much of the novel literally whooping with glee at the most ordinary things, envisioning beauty where others would only see ugliness. "Yes," said Dean and drove right on at five miles an hour. He was knocked out, he didn't have to do the usual things he would have done in America. "There's millions of them all along the road!" he said. Nevertheless he U-turned and came by the girls again. They were headed for work in the fields; they smiled at us. Dean stared at them with rocky eyes. "Damn," he said under his breath. "Oh! This is too great to be true. Gurls, gurls. And particularly right now in my stage and condition, Sal, I am digging the interiors of these homes and we pass them -- those gone doorways and you look inside and see beds of straw and little brown kids sleeping and stirring to wake, their thoughts congealing from the empty mind of sleep, their selves rising, and the mothers cooking up breakfast in iron pots, and dig them shutters they have for windows and the old men, the old men are so cool and grand and not bothered by anything. There's no suspicion here, nothing like that. Everybody's cool, everybody looks at you with such straight brown eyes and they don't say anything, just look, and in that look all of the human qualities are soft and subdued and still there. Dig all the foolish stories you read about Mexico and sleeping gringos and all that crap -- and crap about greasers and so on -- and all it is, people here are straight and kind and don't put down any bull. I'm so amazed by this." Schooled in the raw road night, Dean was come into the world to see it.